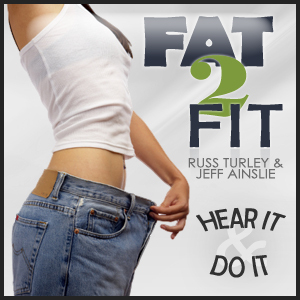 Fat 2 Fit Radio is/was a podcast that was produced from October 2007 thru May 2013. It featured Russ Turley and Jeff Ainslie, and briefly Helena Brigman. The calculators on this site are based on the philosophies expressed on the podcast. Here is an excerpt from the About page. The show is not about fad diets, or get skinny quick schemes. We’re advocating weight loss through lifestyle change, not quick fixes – they simply don’t exist. Stop eating and acting like a fat person and start emulating the diet and habits of a fit person. During each episode we’ll tackle one or more exercise, fitness or diet topics. Week after week if you incorporate the ideas and tips we’re sharing, you will lose weight and start looking and feeling better.